They say Varanasi has over two thousand temples and walking around its narrow galis and ghats it is easy to believe it to be true. There is a presence not just of Shiva and his symbols but also all the other deities of the Hindu pantheon. On top of the ghat steps, under a spreading peepal tree will be not just a shivalingam but a stone image of Hanuman smeared in vermillion; a Ganesh image sits in a courtyard with devotees putting marigolds before his benign visage and may be a Durga or Annapurna temple offers prasad round the corner. Whenever a Shaiva intones a mantra to the twelve jyotirlingams, two temples are mentioned first – Somnath and Kashi Vishwanath. In Varanasi Lord Shiva is Vishwanath or Vishweshwar, the lord of the universe. Kashi is said to stand on the three prongs of Shiva’s trident and these form three hills. Three shivalingams anchor each hill to earth, Omkara in the north, Kedar in the south and Vishwanath in the centre and today it is the reigning deity of the city. The temple and the Manikarnika ghat are said to be the axis of the mandala of Kashi. 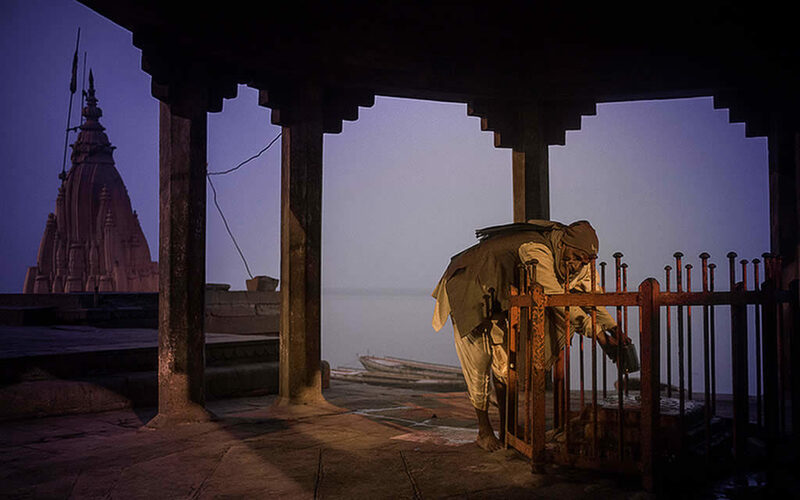 A shrine to Vishwanath at Varanasi is mentioned in many ancient texts like the Puranas and Kashi Khandas but the present temple is not of great antiquity. This is because during medieval times the city faced the religious fury of Muslim invaders time and again. It became a cycle of destruction, revival and destruction from the armies of Qutubuddin Aibak, Razia Sultan, the Sharqi kings of Jaunpur till the time of Aurangzeb who turned most of the important shrines like Adi Vishweshwara and Bindu Madhav into rubble. As a matter of fact for a city of such antiquity Varanasi has no temple that was built before the 18th century. The present Kashi Vishwanath Temple was built in 1785 by Queen Ahilya Bai Holkar of Indore at the site of the earlier Adi Vishweshwara Temple that had been built by Raja Todar Mal, the finance minister of Emperor Akbar. Then in 1835 the shikhara spires of the temple were plated in gold using 820 kilograms of the precious metal by Maharaja Ranjit Singh, the Sikh ruler of Punjab. The temple is located in the middle of a maze of narrow lanes with the legendary shopping arcade of the Vishwanath Gali leading to its main gateway that is always milling with a crowd of devotees. Compared to the magnificent temples of South India with their soaring gopurams, open courtyards, halls and sculpted shrines, the Kashi Vishwanath temple is a small and simple structure built in the north Indian nagara architecture style. It has a main shrine, the garbha griha with the Vishweshwara shiva lingam, with curving multiple spires on top that were originally covered in copper and many small shrines around its courtyard. Also as it is placed inside serpentine lanes it is not easy to get a complete view of the building. However what is instantly felt is the sanctity of the place. There is a palpable ambience of devotion and a feeling of religious fervour that transforms this temple into a truly spiritual experience. Carved silver door lead into the sanctum where the altar is set on the floor and the shivalingam sits under the flaring head of a silver snake inside a square silver altar. The black stone lingam has the three stripes of the tripurantaka drawn on it in sandalwood paste and vermillion. It is covered in flowers – roses, marigolds and jasmines and devotees offer garlands of hibiscus and bilva leaves that are Shiva’s favourite blooms. In the jostling crowds one only gets a short glimpse of the deity as a priest makes a quick offering for each devotee. The temple has an old connection to the Ramanathaswamy temple at Rameswaram where Lord Rama worshipped Shiva after his victory at Lanka. At Kashi Vishwanath the word ‘Ram’ is written on bilva leaves with vermillion and offered as the water from the sea of Rameswaram is poured over the lingam. Pilgrims also carry the Gangajal from Varanasi to the southern dhaam for puja. Around the marble courtyard there are a number of shrines set in niches in the walls dedicated to other gods and goddesses. Facing the sanctum door stands the marble figure of a giant Nandi bull, the vehicle of Shiva and Nandi also gets his offerings. Pilgrims then head for the Gyanvapi well that stands behind the temple and drink its waters hoping to gain knowledge and wisdom. The well stands under an open arcade that was built in 1828 by Baija Bai, the queen of Daulat Rao Sindhia, the king of Gwalior. 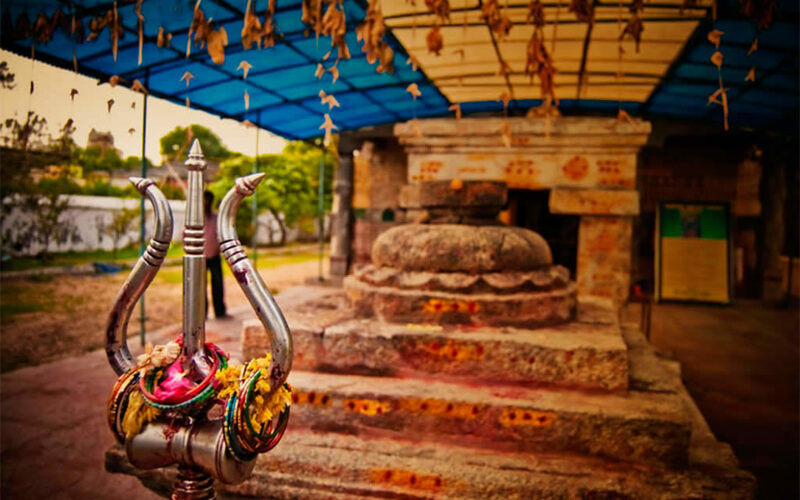 The legend of the well says that Rudra-Shiva used his trishula to dig this well and bathed in its waters, thus giving it the powers of enlightenment. When the earlier Adi Vishweshwara temple was destroyed the shivalingam was hidden in this well and later established in the new temple built by Ahilya Bai. Next to it stands the Gyanvapi mosque built by Aurangzeb using the stones from the temple he had destroyed and one can still see patches of carvings and decorated pillars at its entrance and along its walls. The presence of this mosque so close to the temple has led to much religious tension in the area and there are strict security rules that pilgrims have to obey here. All visitors are frisked before entering the temple. It is safer to leave handbags, cameras and mobile phones at your hotel or in the car as they may not be allowed inside. Entering the temple devotees also offer puja at the shrines of other deities in the courtyard. There is the lingam called Avimukteshwar sitting inside a small shrine in the corner that is said to be older than the Vishwanath lingam and old texts mention it being worshipped during the reign on the Guptas in the fourth century. 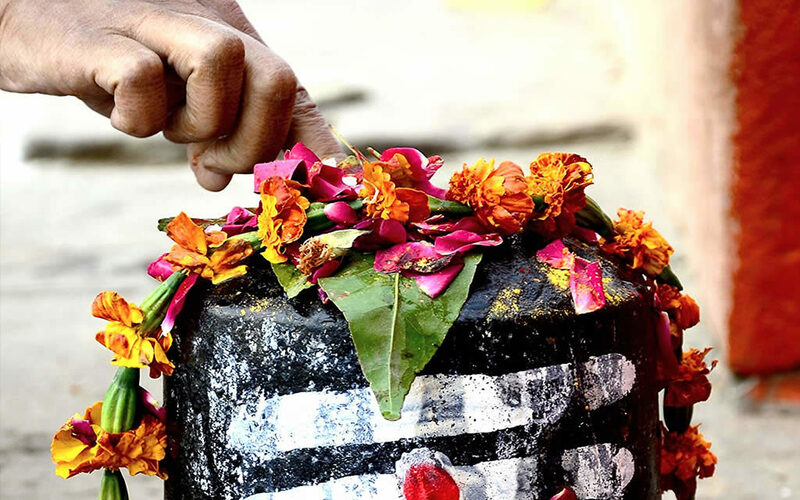 There are many other shivalingams established all around the temple precinct named Nikumbheshwar, Kubereshwar, Kapileshwar, Mahakala, Nilkantheshwar and Vaikuntheshwar and devotees all have their own preferred deities. There are small shrines to the goddesses Virupaksha Gauri, Saubhagya Gauri, Shringara Gauri and Savitri. The two Ganesh shrines here are named Vighneshwara Ganesh and Avimukta Vinayak that once stood in the old Avimukteshwar temple that has vanished. There is a Vishnu image in the main mandapa that is always worshipped along with Vishwanath. While visiting the temple the pilgrims perform a religious ritual called nitya puja. They bathe in the Dasaswamedh ghat and then walk to the Kashi Vishwanath temple along the Vishwanath Gali. After doing puja at the temple and watching one of the five aartis of the day, they visit and pray at the Gyanvapi well and three nearby temples of the goddess Annapurna Bhavani, the demi god Dandapani and the god of good fortune Dhundiraja Ganesh.